Union reporting and disclosure requirements clearly aimed at public employees appear to be the least vulnerable to Constitutional and Federal preemption challenges. Congress specifically exempted government workers from the NLRA's jurisdiction, leaving the states largely free to regulate their public sector labor relations. Consequently, U.S. Supreme Court decisions such as Abood, Hudson, and Lehnert, clearly articulate public employee workplace rights that are rooted in the U.S. Constitution, specifically the First Amendment. The recommended legislative proposal contained herein is a logical extension and fulfillment of the right of union workers to pay for only union spending that relates to collective bargaining. An integral part of an employee's decision to object to unrelated collective bargaining expenses is the need for audited financial information about how the amount of union agency fees is calculated. A worker cannot exercise an informed right to withhold dues unless there is a clear understanding of union spending as it relates to what is properly chargeable to the individual for direct workplace services. Because the United States Supreme Court in the Hudson case has established this employee safeguard, the state legislature is within its constitutional authority to carry out the Court's directions and extend the protection to all dues payers as a matter of a properly balanced labor policy. The legislature would be declaring as principle that regular, annually audited union financial statements distributed to all dues payers is a quid pro quo for the union's right to compel all workers to pay dues. It is anticipated that the union movement will likely challenge the constitutionality of the disclosure law. Fortunately the courts have provided recent guidance in examining other Michigan statutes that have limited a union's prerogatives in the workplace. The cases offer valuable insight into how union financial disclosure legislation for public-sector workersthat can withstand judicial scrutinyought to be framed. Does the statute further "an important or substantial governmental interest?" In Miller, the state's interest in protecting individual workers' First Amendment right to refrain from making campaign contributions satisfied this requirement. Improving union disclosure laws would protect the free speech rights of workers, as well as discourage union corruption and mismanagement. Is the governmental interest "unrelated to the suppression of free speech?" In other words, does the law have a legitimate purpose other than suppressing the union's free speech? The Miller court found that legislation striking a balance between the union's right to solicit political contributions and the individual's right not to contribute is "wholly unrelated to the suppression of free speech." The amendment to PERA will also help to resolve that same conflict. Does the law "burden substantially more speech than is necessary?" The Miller court determined that an "annual mailing to a union's contributing members, asking them to check a box and to return the notice to the union," would be a burden "insufficient to rise to the level of a constitutional violation." To the extent that union financial reporting would be a "burden," it is needed to ensure that unions are accountable to their members, and to expedite the resolution of Beck rights cases. All three of the court's criteria are satisfied by the recommended proposal. The Michigan Supreme court has also approved of substantial public school related bargaining reforms in Michigan State AFL-CIO v. Employment Relations Commission. This case was litigated by the unions after the Michigan Legislature passed Public Act 112 in 1994. The act effected a number of changes in public school collective bargaining, removing several subjects from mandatory bargaining and imposing penalties on teachers who engaged in unlawful strike activities. 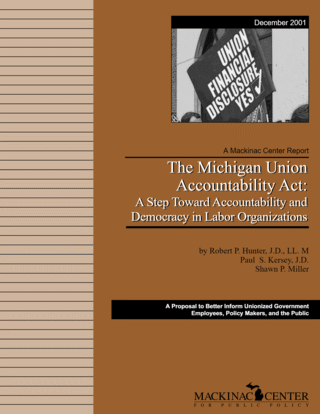 At issue in Michigan State AFL-CIO v. Employment Relations Commission was Section 17, which stipulated that contracts were to be submitted to employees in the bargaining unit for ratification. This ratification power was left solely to employees and could not be delegated. Section 17 prevented state labor organizations from vetoing contracts agreed to by local union officials and approved by workers. In challenging the statutory provision, the unions asserted that the employee veto power restriction in Sec. 17 violated their right to freedom of association because the power to veto a local unit's ratification of a collective bargaining agreement, among other things, allows local contracts to diverge from the standards established by the union. Sec. 17 thus limits the union's power by removing its ability to compel local bargaining unit conformity. In upholding the constitutionality of Sec. 17 the State Supreme Court held that, although a union's power to compel conformity among individual groups and, thereby, for a cohesive larger group, is limited by Sec. 17, the power to compel conformity is not guaranteed to it by the First Amendment. The Court went on to say that the "essential right protected under the freedom of association doctrine is the right to join together in a group of like-minded individuals and exercise free speech rights. Therefore, where a statute regulates the internal affairs of an organization, it violates the members' freedom of association if the compelled change in the internal affairs of the organization in turn affects the ability of the organization's members to come together and exercise free speech." There is nothing in the legislative remedy suggested in this paper that adversely affects the ability of the union's members to come together and exercise free speech. In fact, financial disclosure is the opposite: it promotes democratic governance and the exercise of free speech. Heeding these considerations should place a state in the best possible position to defend against attacks on the constitutional validity of financial disclosure legislation. The analysis above also will enable legislators to make a forceful argument that such a statute is essential to ensure that workers' rights are secure - a traditional state function that can be exercised without impermissibly infringing upon the collective bargaining system. Michigan State AFL-CIO v. Miller, 103F3d 1240 (CA6, 1997); Public Act 117, MCLA  169. 255, et seq. Paycheck protection currently applies only to PAC contributions. Other union political activity, such as get-out-the-vote or issue advocacy are not regulated by it. MCL Sec. 423.201 et seq.